In the national elections, Republicans picked up at least 7 seats to gain control of the United States Senate and expanded their majority in the United States House of Representatives by at least 14 seats. As of this morning, the composition of the United States Senate in the 114th Congress will be 52 Republicans, 43 Democrats and 2 Independents, with 3 races yet to be decided. Again, as of this morning, the United States House of Representatives will consist of 243 Republicans and 179 Democrats, with the final numbers dependent on 13 races that remain undecided. This first Van Ness Feldman post-election alert looks at the agenda of the 2014 lame duck session of Congress, which is scheduled to begin November 12th. This alert includes a link to a list of the changes in the membership and leadership of key Congressional committees, as of today, that are important to the development of federal policy in the areas of energy, the environment, natural resources, transportation and health care. During the next two months, we will distribute periodic updates on congressional developments. In January, we will share our views on the outlook for action on significant legal and policy issues in the firm’s primary areas of practice. Three Senate races are yet to be decided, but the outcome of these races will not change the fact that the election has resulted in Republican control of the Senate for the 114th Congress. The Louisiana Senate race will be decided in a December 6th run-off election between Senator Mary Landrieu (D-LA) and Congressman Bill Cassidy (R-LA). The latest results from the November 4th election show that Senator Landrieu received 42% of the vote, Congressman Cassidy received 41% of the vote and Tea Party Republican candidate Ron Maness received 14% of the vote. Under Louisiana election rules, a run-off is required if no candidate receives 50 percent of a vote, plus one additional vote, in a federal election. If Senator Landrieu is re-elected, she will be the Ranking Minority Member of the Senate Energy and Natural Resources Committee in the 114th Congress. The Virginia Senate race may be headed to a recount. As of this morning, Senator Mark Warner (D-VA) holds a very small lead over his Republican challenger, Ed Gillespie, and certification of the votes has begun. If the final lead is less than one percent, Republican Senate candidate Ed Gillespie may request (and pay for) a recount. If the final lead is less than one-half percent, Virginia law provides for a recount if requested by the trailing candidate at no cost to the candidate. In the Alaska Senate race, Republican challenger Dan Sullivan holds a small, but significant, lead over incumbent Senator Mark Begich (D-AK). Apparently, votes from a number of remote villages in Alaska have not yet been counted and could alter the results of the election. Finally, Senator Angus King (I-ME), who has been caucusing with the Democrats, announced today that he will continue to caucus with the Democrats in the 114th Congress. The lame duck session of Congress is scheduled to begin on November 12th. House Majority Leader Kevin McCarthy (R-CA) has stated publicly his preference to “clear the decks” prior to adjournment in December. This “clear the decks” approach would likely include consideration of legislation that funds the government for the remainder of Fiscal Year 2015 (until September 31, 2015) and passage of legislation extending certain tax provisions. President Obama has invited the bipartisan congressional leadership to a White House meeting on Friday, November 7th to discuss the lame duck session of Congress and legislative priorities for the balance of 2014. Following the White House meeting, and pending further signals from congressional Republicans, other issues could be added to the agenda for November and December. These issues could include the National Defense Authorization Act, confirmation of Judicial and Executive Branch nominees, a package of public lands bills, the Marketplace Fairness Act, and the Internet Tax Freedom Act, terrorism insurance, and the U.S. response to ISIS and the Ebola crisis. While Republicans will not control both Houses of the Congress until January 2015, Republican cooperation or opposition will largely determine the legislative agenda for the lame duck session. Completion of the Fiscal Year 2015 appropriations process, which funds the federal government, will be a priority for the lame duck session. The current continuing resolution to fund the government expires on December 11th. Rather than passing another continuing resolution, Congressional appropriators would prefer to pass an omnibus appropriations bill, containing all twelve appropriations bills, to fund the government for the balance of Fiscal Year 2015. If agreement on an omnibus appropriations bill is not possible, Congress will adopt a continuing resolution to fund the government at current funding levels for as long as possible, including, ideally, through the end of Fiscal Year 2015. A short-term continuing resolution to fund the government into early 2015 remains a possibility, particularly if the Republican congressional leadership insists that government funding decisions be delayed until the new Congress. 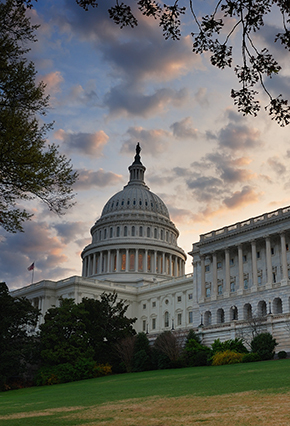 Last spring, the Senate Finance Committee adopted legislation -- the Expire Act -- to extend expired and expiring tax provisions through the end of 2015. Both parties and the Administration have expressed support for the enactment of “tax extenders” legislation in the 2014 lame duck session. House Ways and Means Committee Chairman Dave Camp (R-MI) and Senate Finance Committee Chairman Ron Wyden (D-OR) will lead the effort to secure a bipartisan agreement on tax extenders legislation during the lame duck session. There are more than 50 provisions under consideration including the research and development tax credit and numerous energy related provisions. Importantly, during the lame duck session of Congress, both parties prepare for the new Congress that commences in January 2015. Newly elected Members of Congress will be in Washington for orientation sessions in November, and Committees will begin organizing for the 114th Congress. Republicans will be making a wide range of decisions necessary to assume control of the Legislative Branch of the federal government, including establishing an agenda and priorities for the coming Congress. There will be significant and meaningful changes in both membership and leadership of key committees relevant to public policy regarding energy, the environment, natural resources, transportation and health care. There will be adjustments in the number of Republicans and Democrats on congressional committees to reflect the national election results and there could be changes in the overall number of members on certain committees. The changes in membership and leadership of these key committees, based on retirements and elections that have become final to date, can be found here (for Senate Committee changes), and here (for House Committee changes). We will periodically update this information. Of particular note are changes in the leadership of the Senate Energy and Natural Resources Committee and the Senate Environment and Public Works Committee. With Republican control of the Senate, the Chairman of the Senate Energy and Natural Resources Committee in the next Congress will be Senator Lisa Murkowski (R-AK). If Chairman Landrieu (D-LA) is re-elected on December 6, she will be the Committee’s Ranking Minority Member in the next Congress. If Senator Landrieu is not re-elected, then Senator Maria Cantwell (D-WA) is likely to be Ranking Minority Member of the Committee in 2015. The Chairman of the Senate Environment and Public Works Committee in 2015 will be Senator James Inhofe (R-OK). The Ranking Minority Member of the Committee will be Senator Barbara Boxer (D-CA). With the addition of a large number of Republicans in the House of Representatives, there will be significant changes in the Committee ratios, leadership and membership. We will track those changes as they occur and include those details in future alerts. Van Ness Feldman produces periodic updates and alerts on a variety of subjects in our primary areas of practice. For example, the firm publishes a comprehensive guide to federal funding opportunities that are being provided as grants through the various Departments of the Executive Branch of the federal government. Please go to http://www.vnf.com/KnowledgeCenter.aspx?SignUp=True to sign up for those publications. Finally, we are interested in any feedback you would like to provide on this document or any other alert or update you receive from the firm. Thank you for your interest in our alerts and updates.